Seriously, this is the best way to group your students for multiple opportunities to use language! 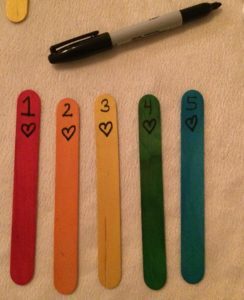 I found this idea on a blog many many years ago and recently tried to seek out the instructions to share during a Professional Development session I am providing. I could not find this specific page but shared the link to the general blog above. 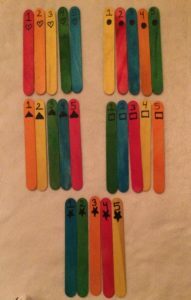 I found my old sticks and have recreated the steps here for you! 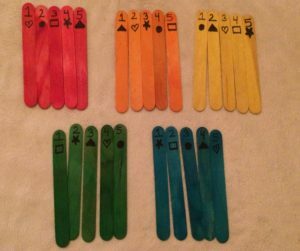 What follows is a way for you to randomly group up to 25 students. 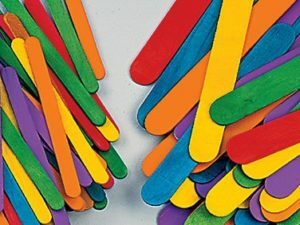 Obviously you can remove sticks for smaller class sizes. 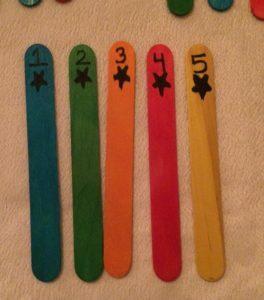 For larger class sizes you can easily add popsicle sticks as “pick your own group” or “free choice”. 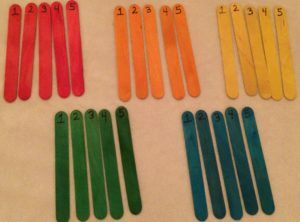 What sets these sticks apart from simply “numbering off” the students is that the groups that you form using the color, number or shape are three unique groupings of students! 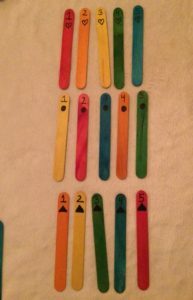 Step 2: Sort the sticks in 5 groups of 5 different colors and number the sticks 1-5. I loved the purple color but could not see the numbers or shapes in black Sharpie so I chose to use the “blue” which is more like an aquamarine. Then I chose circles, triangles, squares and stars. Step 6: Now you have 5 groups of like shapes. Step 7: This is where the magic becomes visible! You are quickly able to sort your students into three distinct groups. This means in three separate group arrangements NOBODY in your class will be clustered with the same person. I love this for many reasons! 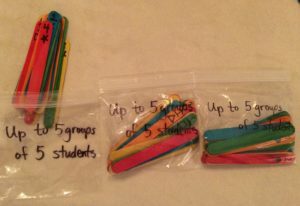 Students who may not have had much to share in the first group formation might borrow some ideas to share with his or her second (or third) group. 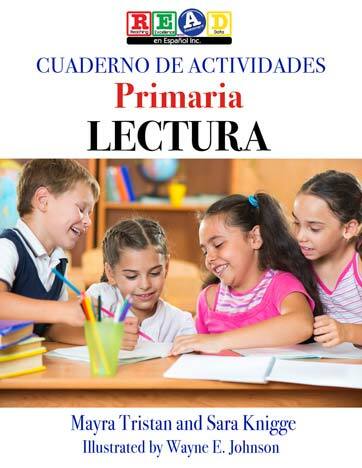 Teachers can easily provide students with opportunities for thoughtful repetition of target language. Don’t forget to scaffold language practice as needed by providing students with the discussion prompt in written form or with sentence starters! The best part of this grouping strategy is that the actual act of forming groups does not take away from valuable teaching time! 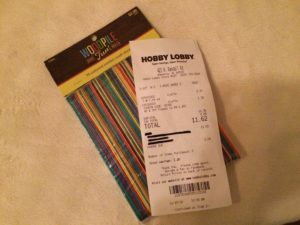 Here are the 3 classroom sets I made with 2 stick packages! 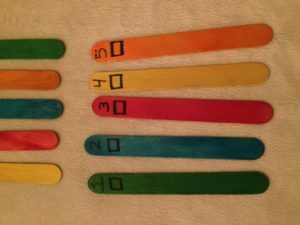 Share this idea and our blog with your teacher friends!